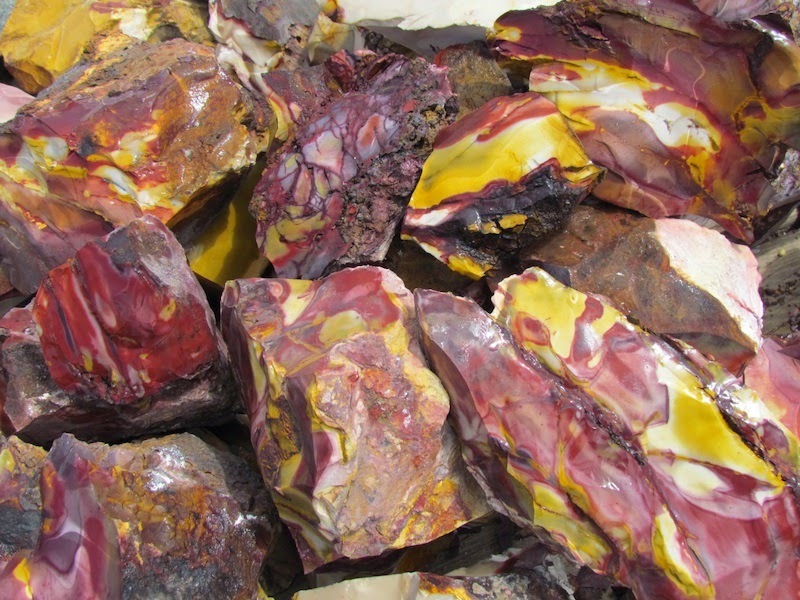 Mookaite Jasper is described as chert, opalite or chalcedony, or a combination of the three, varying only with the degree of silica, and occurs as nodules in the softer clay beneath the creek bed or as multicolored sheets of chalcedony. Although most Mookaite contains only the chemical remains of the radiolaria, occasionally impressions of Ammonites and other organisms have been preserved. There are also rare occurrences of black dendrite inclusions in Mookaite that, when cut en cabochon, produces a dendrite “tree” formation and greatly increases the value. Use Mookaite Jasper to connect with elemental Earth powers for increasing self-confidence, self-worth, and to realize one’s full potential. 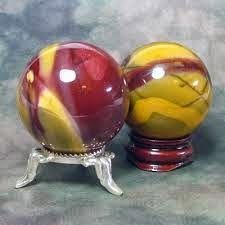 Press a Mookaite palm stone against the upper stomach to activate the Solar Plexus Chakra, the seat of will and personal power. Mookaite emanates the energy of animal knowing, or instinct, and may be used to amplify one’s own instincts when making decisions, especially when there are conflicting factors to consider. Hold the stone close to receive a gut answer and go with it, even if circumstances suggest otherwise. Mookaite also brings assistance in “knowing” the right direction to take in physical and non-physical travel. Mookite Jasper is soothing for the digestive system by reducing stress, and may be used as a gem elixir because it does not over stimulate the body. It may be made by the indirect method, or by letting the stone soak in demineralized water overnight. 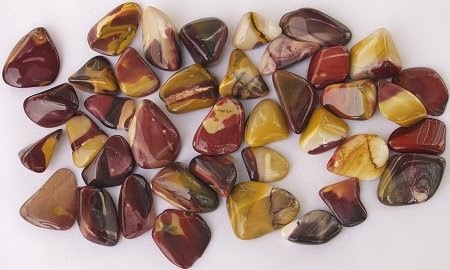 Mookaite Jasper enhances blood purification and is beneficial in healing cuts and wounds. This mineral is also thought to assist in reproduction and aid the body during pregnancy. Yellow Mookaite activates the Solar Plexus Chakra, the energy distribution center and the chakra of relationships. This chakra is located between the ribcage and navel, and controls the immune and digestive systems. When balanced physically, we have strength to fight infections, are free of allergic reactions, and are able to use the nutrients we ingest. Spiritually, when the solar plexus is in balance we are free to interpret the world through our own thoughts and emotions and not live in fear of violating the dictum of others. Mookaite Jasper embraces the power of an ageless spirit, helping one to understand just how closely the mind and body work together. In bringing one’s beliefs about aging and degeneration to the conscious mind, Mookaite imparts the knowledge that change is possible, and that by raising the vibration of one’s thoughts and body, it can greatly reduce the process of physical aging while keeping one young in spirit. Mookaite also activates the deeper aspects of mind by allowing access to genetic memory, revealing emotional and behavioral patterns handed down from one’s ancestry and allowing one to release those patterns so future generations need not repeat them. It is an ideal stone for expectant parents, as it can facilitate intuitive communication with their unborn child. All Jaspers provide a calm, harmonious energy for meditation. They are ideal for grounding and centering at the beginning of a ritual, and ease the transition to a meditative state. Mookaite Jasper is particularly conducive to awakening one’s true spirituality, and for increasing revelations and realizations during meditation. It supports alternate-life work and allows for clearing unhealthy patterns from one’s genetic code.